The Simpson desert is the fourth biggest desert in Australia and the largest sand dune desert in the world. For anyone considering riding the Simpson Desert, expect in excess of 1100 dunes between you and your goal. 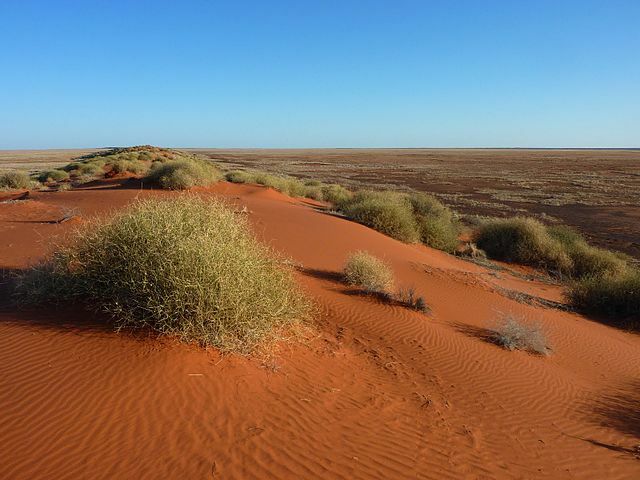 The beautiful red sands make a stark contrast to the deep blue sky. It’s a hard, arid land with very little in the way of vegetation other than scrub. This barren landscape is on occasion interrupted by lakes, though they’ve often dried up to form salt plains. It’s a hard going ride, but well worth the effort for the solitude and sense of adventure you will feel. Proper preparation is essential and the desert should not be tackled lightly. There are several routes across the Simpson Desert, cutting across the sands, up and over the dunes. Expect the going to be slow and plan for at least three days traveling. 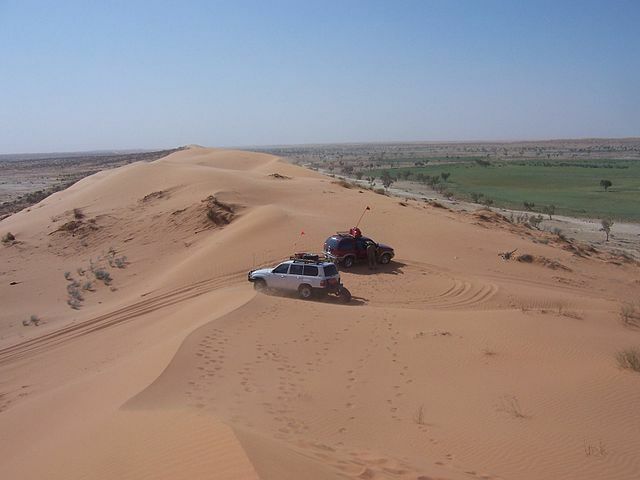 Traveling from west to east is recommended by many, as the dunes are steeper on the east face. From the west, most tracks start at Dalhousie Springs and run to Birdsville. 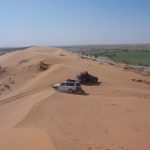 The shortest, most direct route across the Simpson Desert takes you up and over some of the toughest and biggest dunes around. It’s also the most popular of all the tracks, resulting in higher usage and deeper ruts. It runs 425 km from Dalhousie springs to Birdsville, via Poeppel corner and the QAA line. The French line becomes the QAA Line as it crosses into Queensland via the K1 line. Technically starting at Poeppel corner, it runs all the way to Birdsville and takes in the biggest sand dunes of any track, including the famous Big Red. This lesser traveled track is ideal for those looking to escape the crowds during busier periods. It splits from the French line via the rig road and runs more or less parallel, to the south. 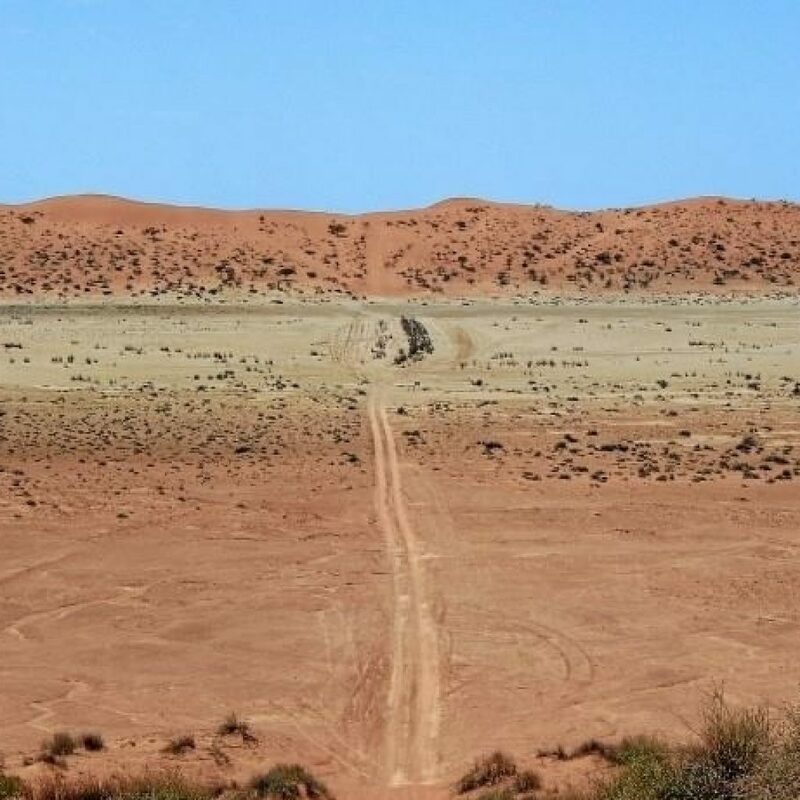 It rejoins the French line via Knolls track, though by turning south on Knolls track it is possible to join up with the Birdsville Track, via the Rig Road and Warburton Track. The WAA crosses smaller dunes and is considered easier to traverse than the French Line. 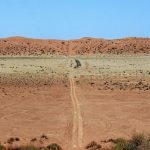 The tracks across the Simpson Desert are well defined, fairly easy to follow and are almost entirely soft sand. An off road bike, lightly packed with soft luggage and low tyre pressure is essential. After rain, conditions become far more difficult, with sections of clay causing skids. The French and QAA lines suffer from deeper corrugations due to the amount of use they get. As such, some sections can be tricky and require careful negotiation. The French and QAA lines are by far the most busiest, with a number of 4×4 drivers and tours making their way across the desert. These lines become particularly busy during events in the area, such as the Birdsville races at the end of August and start of September. The tracks around Big Red are also fairly busy, with increasing numbers of tourists. The WAA line is quieter by far and riders are far less likely to come across other vehicles frequently. The majority of the tracks are only single lane, with poor visibility ahead. This results in the occasional head on collision if drivers aren’t paying attention. Vehicles are now required to use flags to improve visibility. There are no fuel stops in the Simpson Desert or at Dalhousie Springs, so if you’re approaching from the west you will need to get fuel at Oodnadatta. The Pink Roadhouse and Mount Dare Hotel both supply fuel and services. Fuel can also be bought in Birdsville. You will need to be capable of carrying enough fuel for 600 km if you’re taking the French/QAA Line. If you’re tackling the WAA line you will need fuel for at least 650 km. You’ll need enough for over 800 km when heading south from the WAA line and joining the Birdsville Track. Bear in mind that slow riding over soft sand can burn through your fuel almost twice as quickly as normal riding. 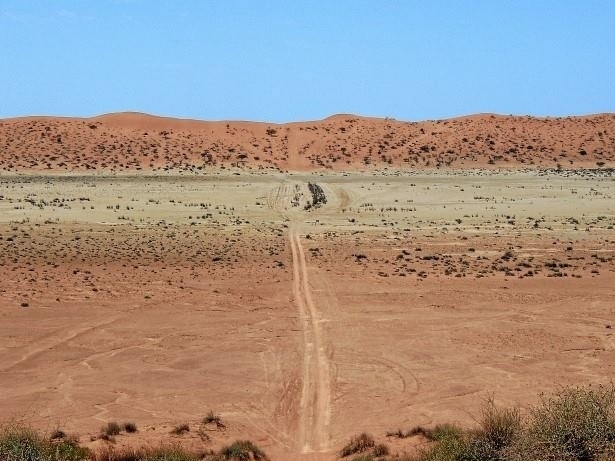 If you’re short on time, then crossing the Simpson Desert should be saved for a later date. You cannot blitz up and over the dunes and should prepare to spend at least three nights camping in the desert. Temperatures can drop to below freezing in the winter months (May – September) and adequate gear should be used. There’s a paid campsite at Dalhousie Springs – the start point, which is worth taking advantage of so you can be fresh when you start the ride. Ten minutes up the road is another campsite which is free with a parks permit – 3 O’clock creek. Both enjoy hot springs to swim in. Free camping facilities can also be found at purnie bore at the edge of Witjira National park, just off the French Line. This marks the point just before the sand dunes begin. There are also several good campsites in the vicinity of Poeppel Corner. Otherwise, wild camping is included in your parks permit and you’re free to set up a camp anywhere off the track. Stock up on food before heading out as once you enter the Simpson Desert there will be nowhere to buy food or drink until you reach Birdsville. Canned food, vac pack meals and other easy to carry and cook essentials should be packed. Take enough water to keep you hydrated for your time in desert, bearing in mind that sand riding can be physically exerting. 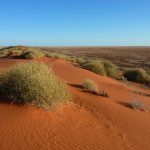 The Simpson Desert is officially closed to the public during summer months, typically between December 1st to mid March, due to extremely high temperatures. May, June and July are all great months to visit, as the temperatures drop. However night time temperatures can also plummet to below freezing, so be prepared to wrap up warm. While the majority of rains in the Simpson Desert are during summer months, rains have been known to cause floods in July. Rain can create dangerous driving conditions and render tracks impassable. To travel the aforementioned tracks riders must obtain a Desert Parks Pass. They cost $150 and can be bought online from the South Australian Parks and Wildlife Service. Allow plenty of time to get one, as there must be a minimum of fifteen days before they are valid. The pass entitles you to travel through seven desert parks for twelve months and allows you to camp within the majority of them. For many riders the appeal of crossing the Simpson Desert is the challenge, adventure and achievement. The main sights are the beautiful red sand dunes, the salt plains and the vast emptiness. Witnessing sunrise and sunset from the top of a sand dune is an incredible experience. The night skies are also some of the clearest, most star filled you will ever gaze upon. Big Red is largest dune, standing at over 30 metres tall and will be the last one you crest if coming from the west.